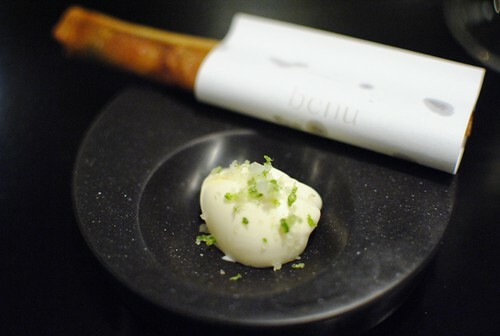 Just over two weeks ago, Corey Lee opened up Benu, one of San Francisco’s most anticipated restaurants in a while. 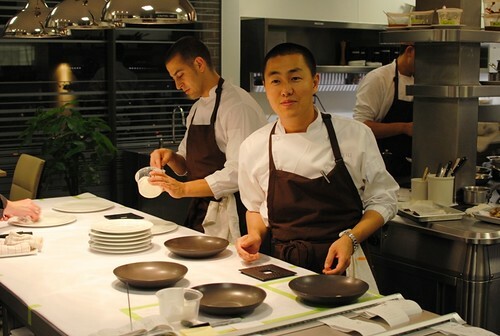 You see, Corey Lee was chef de cuisine of The French Laundry for four years, before leaving in 2009 to set out on his own. That pedigree alone brings with it a lot of hype and high expectations. 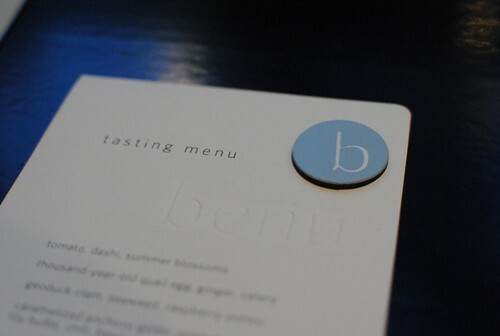 The resulting restaurant is Benu, focusing on Asian-inspired flavors, French technique, and local, seasonal ingredients. 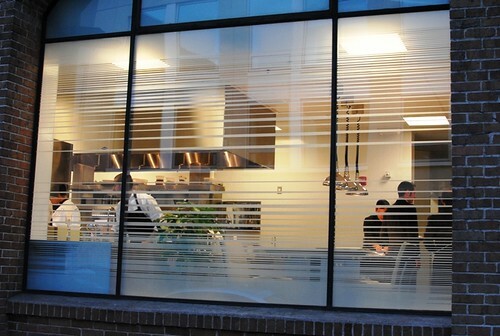 The kitchen has two large windows open to the street, allowing passerbys to peer into the kitchen. 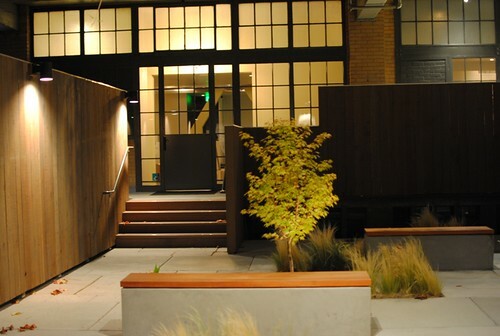 As you walk up to the restaurant, you are greeted by a small outdoor patio/waiting area. 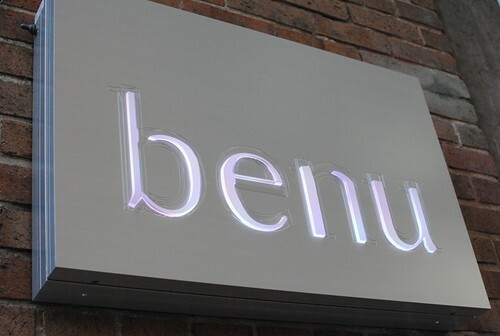 Benu offers two menus; an a la carte option, as well as a tasting menu (of around 16 courses) that changes daily. We opted for the latter, as it allowed us a whole range of dishes to try. 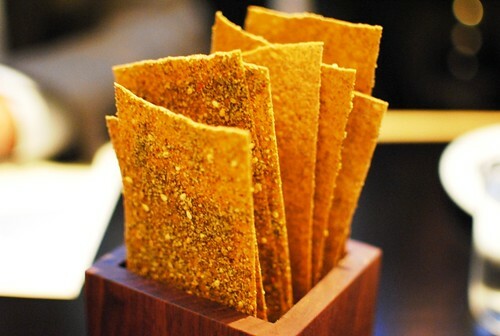 The first thing to come out was the ‘bread,’ in this case, a lavash with sesame and nori. It’s a very thin cracker with Japanese accents from the sesame and nori. Rather addicting, these did a good job of getting your tastebuds going early. These first two dishes came out as a pairing. We were instructed to eat the egg first – the salty and rich flavor was accented by a little hit of ginger for an extra burst of flavor. 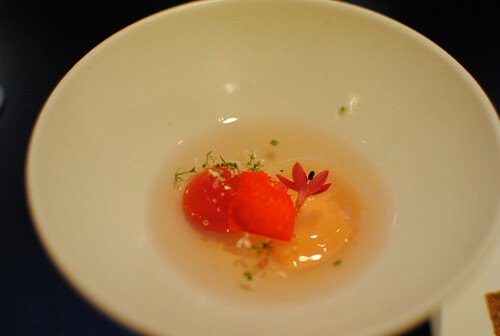 The dashi broth was cool and cleansing; the tomato and summer blossoms added a ‘summer’ flavor to this dish. The next two courses also came out as a pairing. The geoduck had a fresh and clean flavor, slightly salty of the sea, with a nice ‘chew’ to it. 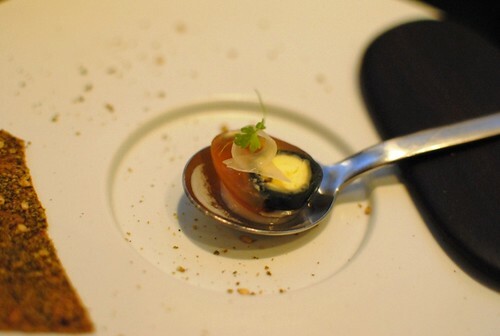 The seaweed, however, was a little overbearing, bringing even more “sea” flavor into the dish. 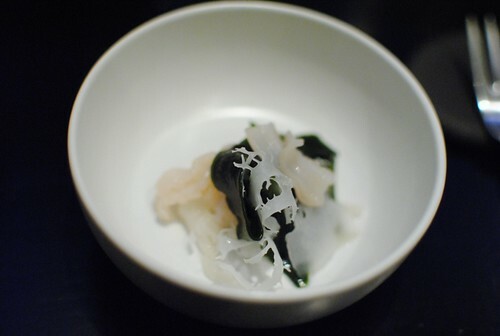 The anchovy gelee was wonderful – not overwhelmingly salty or fishy, and complemented by the textural elements of the peanuts and the lily bulbs. Next came sweetbreads, which were very delicately fried. 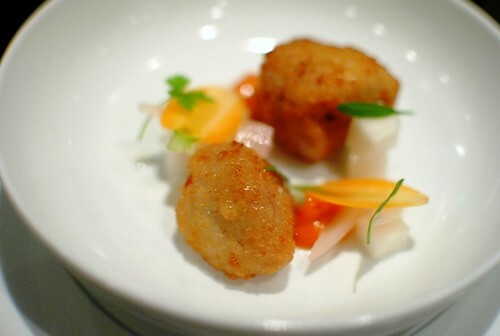 The sweetbreads had a meaty, somewhat creamy texture, and the fried batter added a nice crispiness. 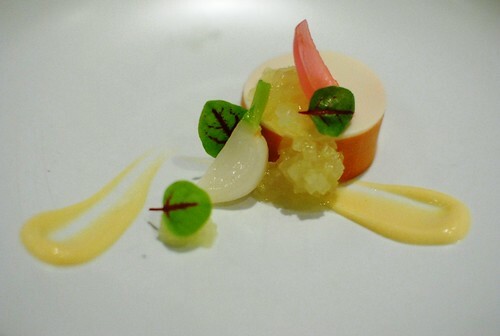 The yuzu and pickles added some acidity to level out the richness of the dish, which was a definite success. Here we have eel and avocado wrapped in dough, for a cigar-like pastry. The avocado was not too noticeable, however the creme fraiche did a good job of adding some light sourness and acidity to go with the fried roll. However, one person found an eel bone in their food! Being someone that spent some time in the ER earlier this year for an eel bone-related incident, this was really disappointing to see. 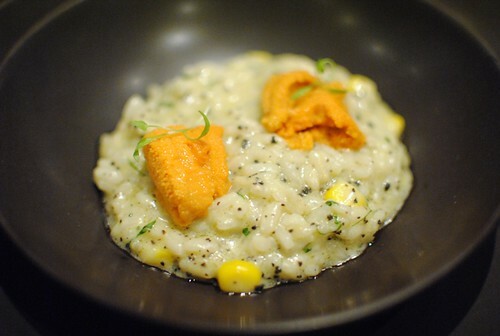 Risotto with black truffles and…what, sea urchin? Yes, sea urchin. This was my favorite dish of the night. The risotto was simply delicious and rich, and I thought the urchin held its own, adding a clean sea flavor, to go along with the earthiness of the rice and truffles. 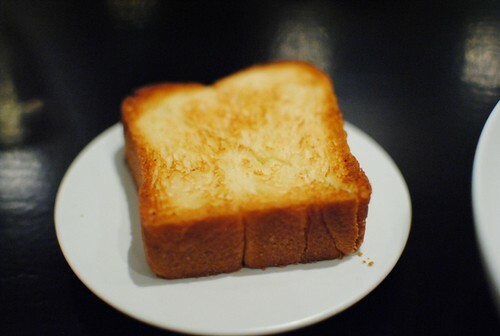 The monkfish came with a delicious, light and buttery brioche. The torchon was very spreadable, though a little fishy. The apple relish added some fresh flavors and crunch to the dish. Shark fin would be a pretty controversial ingredient for this type of restaurant in San Francisco. That doesn’t mean you can’t make a dish inspired by it. 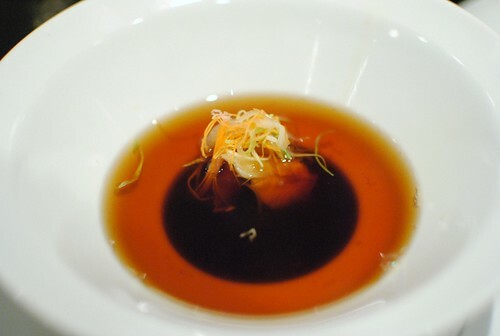 The soup has a very rich and deep umami flavor..which really did resemble a shark’s fin soup. The custard (at the bottom) was so velvety smooth, adding an earthy truffle essense. Really superb dish. The abalone, which is a nice big piece, was quite chewy, somewhat tough. That was a little disappointing. The flavor was good, though, and the pastry added a crispy and flaky component that meshed well. 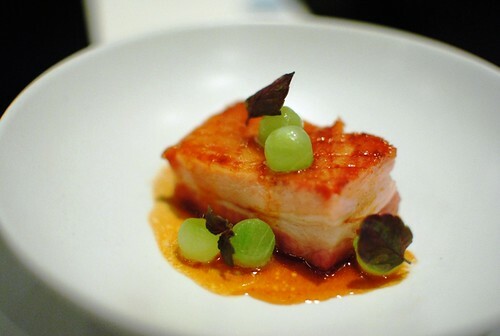 A beautiful piece of pork belly was presented next. Though it was relatively lean, it was tender, juicy and flavorful – made even better by its crisped skin. The small balls of cucumber and shiso helped add some lighter flavors to balance out the dish. The beef was sliced thin and grilled. It was disappointing, as it was neither juicy nor had the same succulence that meat typically has. In addition, it was served somewhat lukewarm, so the fat in the meat had solidified a bit. 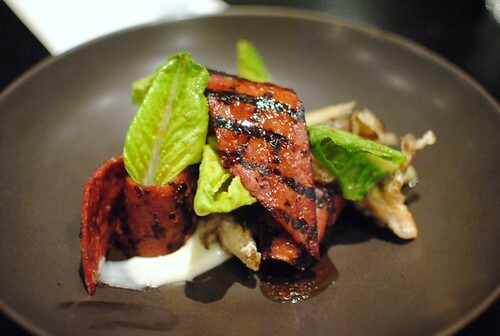 The mushrooms were tasty, and the lettuce had a nice, crisp flavor – but the centerpiece of the dish fell flat. 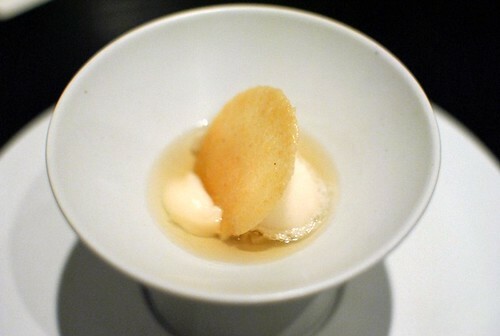 Soothing and refreshing, the asian pear and sweet rice flavors were both evident. I really liked the cookie as well, adding some texture. There was an overarching floral flavor from (I think) the pine-needle infused honey, which was almost too strong. 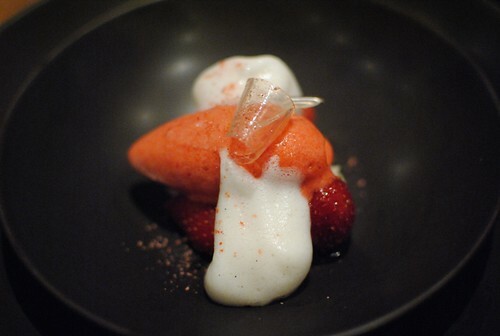 The strawberries and strawberry sorbet were both good, but the crunchy shortbread and vanilly soymilk foam made the dish for me. The foam was eerily like a vanilla soymilk and went well with the strawberries, and the shortbread added some delicious texture to the dish. However, the jasmine pearl tea gelee on top did not taste like anything, even by itself. 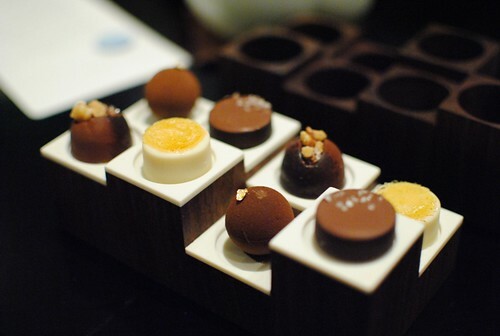 Lastly, chocolates are presented for the table. On this night, we had a lemon creme brulee, toasted sesame chocolate, walnut chocolate, and simple chocolate truffle. Oddly, for a party of 3, we were given 2 of each. My favorite of these was actually the basic truffle (with the gold flake) for its really silky chocolate interior. Service was exceptional. While most would say that it’s expected at an establishment like this, I agree that it is. But very often, it’s not. As for the food, it was a very solid meal, but not without some disappointments. So much of one’s satisfaction of a meal is based on expectations going in and, admittedly, mine were very high. Deservedly so, I think, given Corey’s background, and the amount of buzz surrounding the restaurant. Many of the dishes were very successful in my opinion – sweetbreads, risotto, pork belly, and “shark’s fin soup” come to mind. 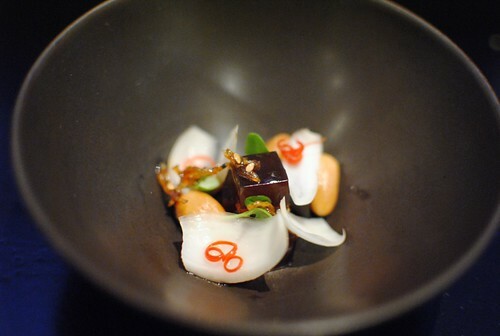 The beef dish was very disappointing, but outside of that, there were no big missteps, save for the eel bone. 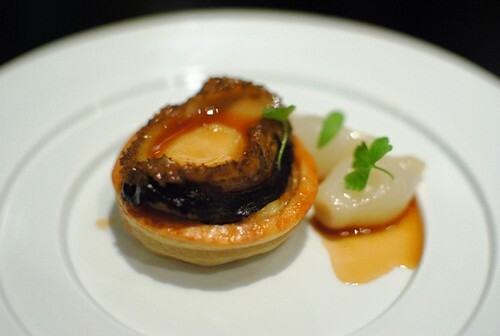 The menu is well-crafted, showing a pretty diverse range, and the tasting menu has a really good progression of courses. I will likely be back to try again, not too far into the distant future. Pretty much exactly what I was expecting from my number one “to-eat” place in the Bay Area. Looks to be a shoo-in for a ** rating in next year’s Michelin guide. I have no doubt you’ll make it here on your next trip up – seems right down your alley. I’ll be interested to see what you have to say about it.